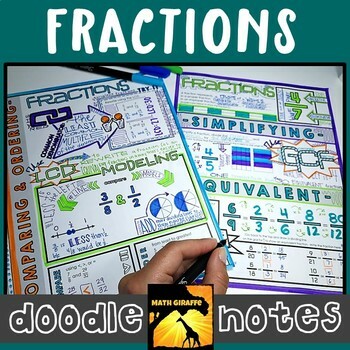 This post originally appeared on the blog Math Giraffe. Whether you’re a first-year teacher or an experienced teacher, it’s always great to get some new ideas for the upcoming school year, and there’s no better time to think about it than over the summer! 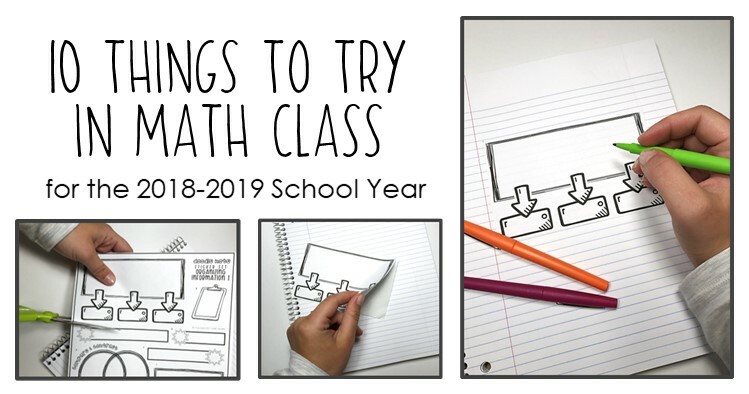 Grab a summer drink and get ready to get inspired, because I’ve rounded up 10 things you absolutely MUST try in math class for the 2018-2019 school year! 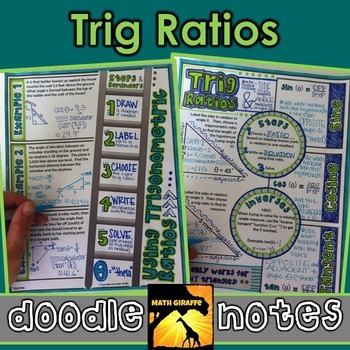 Getting your students to take good notes can be quite a challenge, but I’ve noticed that giving a notebook grade greatly increases the number of students who are engaged in the note-taking process. 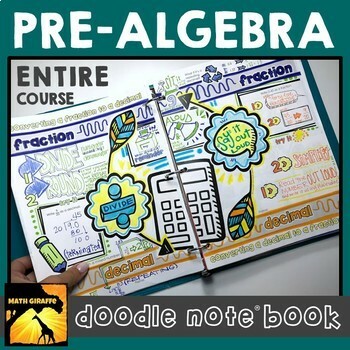 I keep a list of each section (by lesson topic) of notes that should be present in the notebook and quickly flip through to verify that the notes are there. After looking at the first three notebooks, the rest usually take only about two minutes per notebook. I can quickly tell if something is missing. To read more about how I give out notebook grades, check out this post! 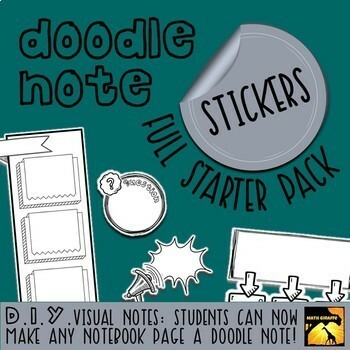 If you are hoping to boost your students’ understanding and retention of a lesson, you can’t beat doodle notes! However, some days you might be in the mood for a twist while keeping it a “little-to-no-prep” lesson. 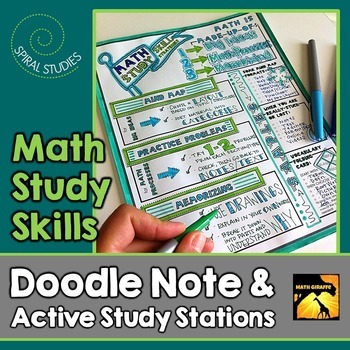 An easy way to maximize the brain benefits of visual note-taking without having to do a ton of prep work is to use DIY doodle note stickers. 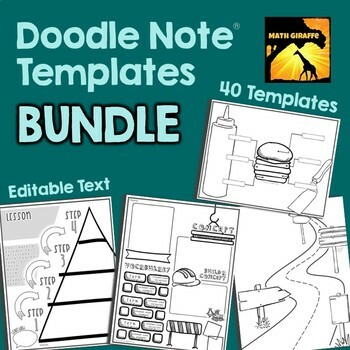 Head to this post, grab your free set, then print the list of all of your options, and read about all of the ways use can use doodle note stickers! 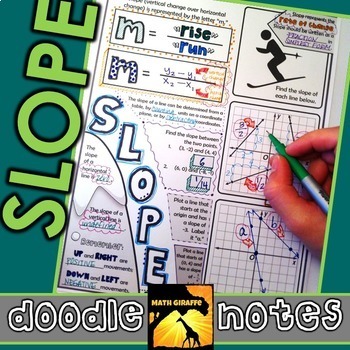 Want to make your math class one all of your students look forward to? Consider creating a weekly or monthly challenge that will both get your students’ spirits up, and get them thinking hard about math! Students love to be deemed the “Weekly Mathematician.” Set up a fun bulletin board in your classroom with room for a weekly challenge problem. 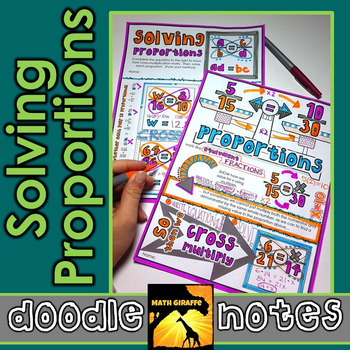 Post an envelope or craft a box where students can easily slide their answers. A classroom tournament is a great way to kick off the year. These middle school tournaments review the previous year’s curriculum and can be used at the end of the year or at the beginning of the next as a review. I have always been hesitant to offer too many prizes or rewards, but sometimes I notice that even just bothering to put a stamp, sticker, or handwritten note on a student paper goes such a long way! 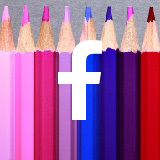 Grab a colored pen and take 20 seconds per student to write a special note on the next quiz you grade. Or, check out this list of inexpensive rewards for teen students. 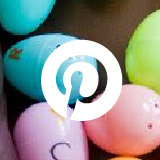 These are simple and creative ideas that will get your kids motivated. As more classrooms become 1:1 (one tech device per student), it’s important to incorporate the available technology, so that your students become more and more comfortable and knowledgeable with it. My friend, Leah shared her take on a station-rotation model that is both simple and effective! She shares, “Station-Rotation is pretty much exactly what it sounds like — the teacher sets up several stations, at least one of which is digitally-based, and the students rotate through the stations in small groups. Consider incorporating available technology into your lessons for the upcoming school year! Leah’s blog (linked to above) is an amazing resource for teaching with technology. Most importantly (at least to me) is that she blends the tech into her classroom. This blended approach means that she still uses paper and pencil, discussion, and hands-on activities where it’s appropriate. When using technology, it’s so important to not overdo it. Leah’s “blending” strategies allow her to get the best of both worlds and choose whether old-school or tech-based is most effective for each lesson objective! In a high school Geometry course, I noticed some kids were having a lot of trouble thinking critically to determine whether statements were true or false; I realized that we need to explicitly teach this skill all throughout math subjects. The easiest and most concrete way I’ve found to do this is through “always, sometimes, never” questioning. Kids cannot think through these types of questions without mentally testing cases. Testing and finding counterexamples is such a key skill to practice! If you go a step beyond to have them support their answers, they will be forced to justify by using both examples and counterexamples. To learn more about “always, sometimes, never” questioning for different topics in math, you can read this post! I’ve tested and tweaked an awesome structure for test corrections, and it has been incredibly effective for me in EVERY secondary math class I have taught, from basic 6th grade math to Honors Algebra 2. If you have not tried offering test fix-up opportunities, think about trying this procedure. I allow students who complete test corrections to earn back half of the points that they missed on the test. A student who did poorly, but is willing to go back and figure it out can make an appointment with me to go over the material together. They can bring their test grade up just a bit, but not as much as if they had gotten the problems right the first time. The key to developing a good correction strategy is to keep students accountable while working toward the goal of mastering concepts even after the chapter is over. To read the details of my procedure for test corrections, check out this post! Using humor in math class not only makes it more enjoyable, but it has SO many benefits, including boosting retention, building relationships, and reducing math anxiety and stress. Incorporating humor is actually easier than you may think! Try starting off the class with a giggle-worthy math meme, or a personal funny anecdote. For more tips on this, read Brain Benefits of Humor in Math Class. To find more hilarious math memes and jokes, head over to my Math Humor Board on Pinterest! 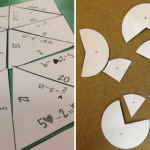 Geometry concepts stick best in student brains when they are investigated in a hands-on way. An inquiry structure helps students to understand a concept more deeply, connect ideas, and remember properties. My favorite tool for teaching Geometry with technology is GeoGebra. With the GeoGebra software, you can set up a lesson for your students in only a minute or two, and they can see relationships in figures that are impossible to view and manipulate in a typical math lesson or lecture. This software is free for teachers and students to use. 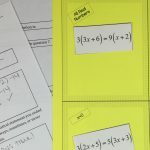 I have put together a quick-start guide with a few sample lesson ideas, that you can read in this post. 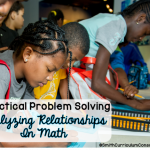 To combat this silly misconception, consider using some of Noelle’s ideas, from Maneuvering the Middle, on this exact topic — 7 Ways to Make Math Relevant. One of my favorite ideas is to teach your students financial literacy, because there is NO DOUBT they will need this someday. You can incorporate salaries, taxes, expenses, etc. depending on where you are in your curriculum. This unit covers it all in a fun way where students choose their home, vehicle, and more! 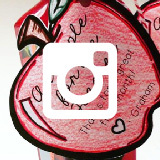 What new ideas are you going to incorporate into the upcoming school year?! Brigid has taught a range of middle and high school math courses, but her real passion is Geometry! She loves to teach proofs, and enjoys blending fun and rigor into math class. 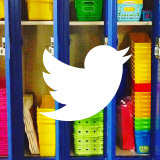 Discover creative and unique strategies for teaching by stopping by her blog. Or visit her on Pinterest, Facebook, Instagram, or at her TpT store Math Giraffe. 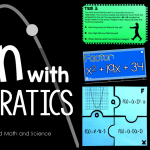 ← Fun Quadratic Formula Activities!